1. 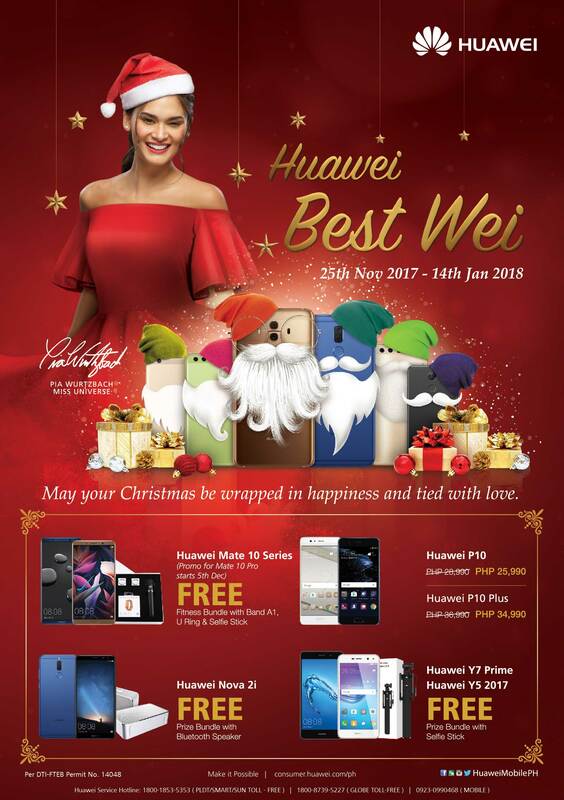 The promotion is open to all customers of HUAWEI Device Philippines purchasing from HUAWEI Experience Store and HUAWEI Retailer partner. In order to qualify for this Promotion, end-user must purchase any of the following HUAWEI units. HUAWEI Y7 Prime, HUAWEI Y5 2017, HUAWEI nova 2i, HUAWEI T3, HUAWEI P10, HUAWEI P10 Plus and HUAWEI Mate 10 during the promo period from November 25, 2017 to January 14, 2018 (“Promotion period”). The HUAWEI end-user is entitled to a freebie or price drop for every purchase of the HUAWEI Units. 3. Freebie will be provided upon purchase of consumer in claiming date itself.